From Low to High ends. With this config, the ame will try to adjust as better as possible to run well, if using the low-end option, or with extra effects, using the high-end. Remember I’ve said I removed the second background layer? Well, with high-end graphics mode, I will get it back, but as a foreground; and it even includes a setting for transparency! Other feature I plan to add in high-end graphics mode is adding a blue transparent layer over water, and more should follow. Now, i you have an slow device like the PSP, you can pick the low-end graphics mode that will adjust the game to run in 30 frames per second instead of 60, making physics and collision detection a bit worse, but assuring game does not run slower than it should. 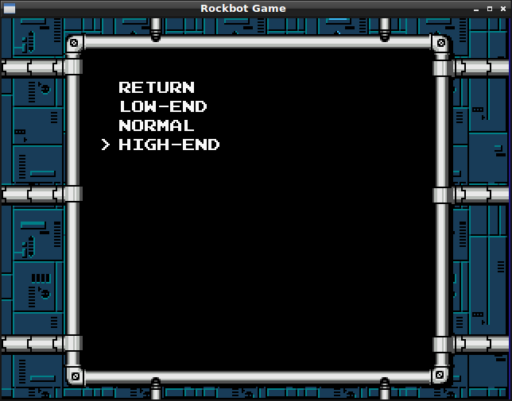 There are still a long road until Rockbot 2 final version, stay tunned! Well, plans change. Last time I was planning 2-months releases with minor fixes, but due to the help of several people, I decided to push ahead a plan to create Rockbot 2, but things are never that simple. 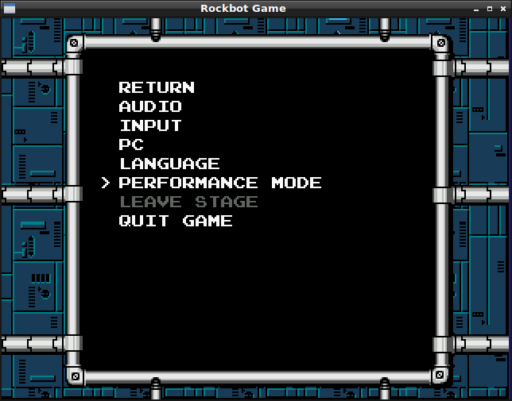 We’ll convert the old game to the new format/engine, so that it takes advantage of all fixes and new featurs such as running at 60 FPS with much better jumping, and to find issues and missing features on the new engine to prepara for a future Rockbot 2 release. And that is I wanted to tell you guys, the second game will take time to get out, we’ll only release a single demo with one stage. The reason is that there are a lot of things we need to change and fix, and we want to make the game better than the previous one, that was nice, but a bit simplistic in stages interaction. 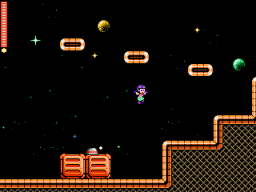 Let me give you a good example, in megaman 3, on Magnet stage, there were thos little flying magnets that pulled Megaman and allowed him to cross some pits. This was unique to that stage, and gave something that related how you play the stage with the stage theme, magnets in this case. I want this type of integration in the game, but that takes time, first to design the stage and put the ideas on paper, then create code, graphics, artificial inteligence, enemies to finally test all. permitir ao usuário definir cima/baixo/esquerda/direita nas configurações de controle. a configuração de controle será aplicada apenas ao sair do menu de configuração. correção para evitar que a versão release do editor quebre no Windows. transição de tela mais rápida no Android. impedir jogador de disparar mais projéteis após utilizar um ataque especial de braço de armadura. nova checagem do número máximo de projéteis que leva em conta o tipo, arma ou normal, dos mesmos. se o pulo passar de 80% da altura, continue o executando mesmo que o jogador solte o botão de pulo. novo tipo de objeto, para cápsula do chefe final, que resolve o problema do personagem desaparecer na última fase após derrotar os 8 chefes. não permitir jogador pular quando estiver na animação de atingido. reduzido tempo e quantidade de movimento para trás quando o personagem é atingido. diminuído o tempo de duração de animação de quando atingido, pois estava maior que o tempo de intangibilidade. Ajustada inteligência artificial do Dynamite para ele não dar dash ao ser atingido, pois era muito injusto para enfrentá-lo. Os projéteis do Shocker agora usam trajetória tipo senóide. allow user to set up/down/left/right keys in input config. the input configuration will be applied only when the user leaves the config menu. fix editor release version crashing in Windows platform. faster screen transition in Android. do not allow player to shot more projectiles after firing an amor-piece special one. check the maximum number of projectiles depending on type, weapon or normal. if jump height surpasses 80% of total height, continue jumping even if player releases the jump button. new object-type for last boss capsule, fixing the old bug of player vanishing on last stage after beating all 8-bosses. do not allow player to jump while on push-back. reduce push-back duration and movement. adjust hit animation to endure only while player is intangible. change Dynamite’s AI*, so it won’t dash when hit as it makes the fight too unfair. Shocker’s projectiles must use sin trajectory. Pegue o jogo no nosso link de downloads. Novo sistema de física para pulo, mais próximo a Megaman/Rockman. Sub-Chefes de fase, com sala que impede passagem do jogador até que o mesmo seja derrotado. Ao completar o jogo, dois novos personagens tornam-se disponíveis. Revisão e reformulação de estágios. Três partes de armadura que dão uma nova habilidade dependendo do personagem escolhido. bloco que pode ser destruído com explosão. tanque especial, recarrega pontos de vida e energia juntos. Possibilidade de escolher direção (esquerda ou direita) de um objeto ao colocá-lo no mapa no editor. Terreno tipo gelo com inércia (escorregadio). Grande melhoria de desempenho do jogo com retirada de chamada dupla à atualização de tela. Respawn de inimigo pode ser definido no editor. A combinação baixo + pulo não é mais usada para slide. O botão deve ser utilizado no lugar. Removidos gráficos modificados para quando um estágio é completado. Correção de movimento da arma Chain, agora ela segue o jogador. Melhorias e correção nos textos do jogo. Diversas correções de bugs e pequenas melhorias. você pode acionar a bomba com o botão de tiro. ao paralisar inimigos um efeito de centelhas é mostrado na tela. paralisação não afeta jogador se ele estiver intangível por ter sido atingido. Magic Star agora precisa de 3 hits para sumir. bombas não podem ser refletidas. Grab the game from our downloads link. New physics system, much closer to Megaman/Rockman. 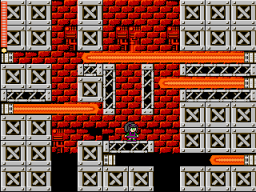 Stage sub-bosses, with room that blocks player passage until it is defeated. When game is finished, two new characters become available. Three armor pieces that give each character a different ability. Block that can be destroyed with explosion. Special tank, recharge both hit points and all weapons. You can now set the direction (left/right) of an object when placing it on the map in editor. Great optimization in the game with the removel of a duplicate screen updating call. Enemy respawn can be defined in the editor. Combination of keys down and jump isn’t used for sliding anymore. use button instead. 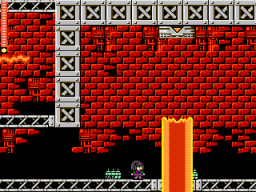 Removed stages using different tileset after beaten. Fix chain weapon behavior, it now should follow player movement and direction. Improvements and correction in game dialogs. Several bug fixes and small improvements. You can activate the bomb by pressing attack button. When enemies are paralysed a spark effect is shown in screen. The player isn’t paralysed if intangible after hit. Magic Star needs three hits to dissapear. Next version is on slow-motion development because I have little time left, as I have a Retron 5 and I’m playing old classics from NES/SNES lately. 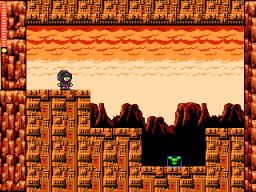 So far, I’ve added two new characters to choose from, each with new special abilities like double jump and air-dash. Also, the movement physics are entirely remade, making is very, very close to Megaman games, the bad part is that all characters now will have the same jumping and speed, being differentiated only by its abilities such as slide, double-jump, less damage taken, no push-back and so on. 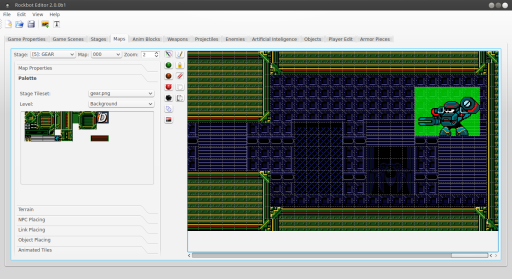 To improve things a bit, I plan to add powerups like Megaman X and a store where you can buy some extras. Another idea is to remove all copyrighted material that still exists in graphics and add a payment system, because, you know, I am doing this for free and could get a bit of money to port the game to platforms such as the Wii, Nintendo 3DS and such. Right now, I’m buying consoles to port from my money, and I currently do not have a lot of it to spend. Also, as no one besides me is using the editor, and it has some problems to run on Windows that I was not able to figure out, I will not distribute in the same package anymore. If you want it, ask me. I plan to resume work next weekend and during carnival, so it should move ahead to a first beta once I fix some annoying bugs that appeared due to engine changes. The roadmap for this version is very long, so I’m thinking in maybe start doing incremental releases, putting all ideas on file-format on 1.1, but not all of the features on the game itself, that will make into 1.2, 1.3, and so on. Let me just begin explaining why Rockbot was seeing so few updates after the 1.0 release, I lost the job I had as a contractor for HP Brazil and the search for a new one was not easy nor without some stress. Finnally I was hired for a company that handles electronic funds transactions, while the tasks were actually good, I had to work ~9h/day and the bus I got to get back home took one to one and a half hours. Basically I barely had time for living, much less to code Rockbot. The free time I had was used to watch TV and play games on my Playstation 3. Lady lucky smiled upon me however, and a new oportunitty in one of the best “companies to work for” in Brazil surfaced, and I grabbed it hard. So I started working for it on last 6th Oct., with usual 8h/day and the bus takes less than 10 minutes to reach. 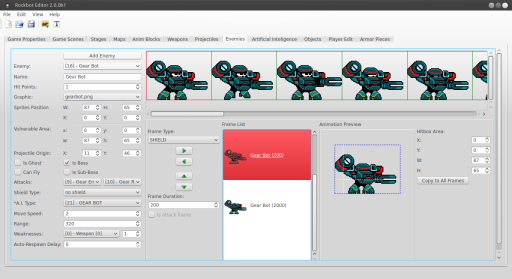 While in the first weeks I have a lot to learn, soon enougth I’ll again have free time to code my game. And even with the little time I had, I made a plan for the road. I will not release Rockbot 2 soon, simply because I do not have an artist to assist me into creating bosses and stages right now. In the future, maybe I hire someone for the task, but first I’ll keep improving Rockbot 1, by putting new features that were planned for Rockbot 2 into 1.1 and 1.2 releases. 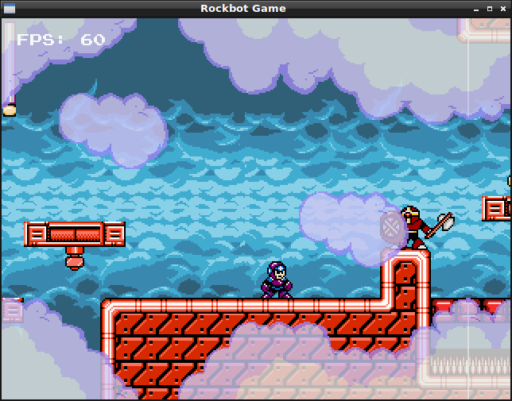 Things like improved artificial inteligence, slippery terrain for ice floors, more stages with two castles like Megaman5 and more selectable characters will come into Rockbot1, using the same old bosses and graphics. The 1.1 release should be smaller, as I need to set up the foundations and fix a lot of bugs from 1.0 that still ramains, with 1.2 being what Rockbot2 is supposed to be just with the same old stages and enemies. If you know of any artist interest in helping to create a game, please send an email to protoman@upperland.net as any help is welcome. 1.0.3 was the last version on 1.0 series. The question that arises then is, what now? There won’t be, for now, a Rockbot 2, simply because we do not have any artists to create graphics for bosses, enemies and stages. Also, I’m with little free time lately, you know, I like to play games besides creating them. reformuled file-structure that use smaller sizes when possible, lowering memory usage. and adding support for all forecast features. in-game store and bolts usage. replace capcom sounds for free ones. replace capcom graphics for free ones. ports for OSX, iOS and PS2 CDROM. simultaneous 2 player support (offline). add effect (snow, rain, dark, auto-scrolling) to stage. network play (if platform supports it). google play support in Android (cloud thophies and save). 1.0.3 is out, have fun! First, let me explain:the 1.0.2 version was released only for Android. This is because I’ve found some bugs and felt the version wasn’t really ready, but needed a urgent fix for Android users. This version have some important bug fixes and improved the game a bit. I now started working on 1.1 version, that will have lots of new feature I’ll tell you guys later. As usual, you can get it from our downloads page. Some ports will be released later, we now have both 32 and 64 bits Linux based on Ubuntu and Mint. People asked me for Rockbot 2. I then asked for help. Just a little, just some ideas, a few drafts. No one answered. Not a single one. This is a one person project, no matter what I do. And this person here started on a new job that takes 9h/day and lots of effort, meaning no free time to create graphics. Unless I win the lottery and have money to pay an artist/designer, a Rockbot 2 won’t exist. What I will do is keep pushing slowly some updates and improvements in the game core, change some features and invest a lot in the editor. Want Rockbot 2? Then start making graphics, mockups or ideas, even if you just draw with a pencil, and send me to protoman@upperland.net. But Rockbot 1.1 and 1.2 WILL happen.